This weekend, like apparently millions of other people, (it was #1 in the box office) I saw The Lorax. I remembered the book from when I was a child along with all of Dr. Seuss‘ other books like “The Cat in the Hat,” Green Eggs and Ham,” Horton Hears a Who,” etc. 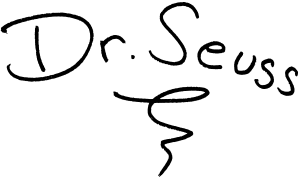 Since I was a “misfit” kid Dr. Seuss spoke my language–“Try new things.” “Stick up for the little guy.” “Don’t give up if you believe in something.” “It’s okay to be different.” These were ideas that kept me going and that I still hold dear. Unfortunately, the movies that have been made from these deeply cherished books, including The Lorax have fallen short of my expectations. Aside from the weak characters and questionable (but catchy) songs, the problem with this movie was reality. How so? The message is still the same–“I speak for the trees,” the Lorax says.The Lorax also worries that “progress progresses too fast.” In our world of disposable everything and planned obsolescence, it is cause for concern. As an advocate of environmental causes and sustainable products this is a wonderful message and a reminder that we should educate our kids about the environment and the costs of ruining the earth. It was heart-warming to see children leaving the theater asking their parents if they could plant a tree. However, as I was sitting in that darkened theater I began to think about how much ‘speaking for the trees’ has become the kind of big business it lobbies against. 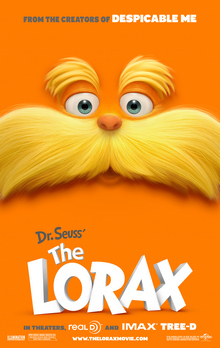 How many trees fell to make and distribute The Lorax? How about the SUVs, diapers, etc. that use the movie in advertising? I am not sure Dr. Seuss would have liked this kind of hypocrisy. 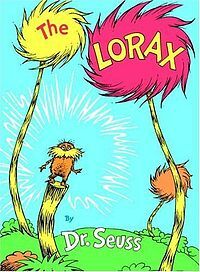 Of course The Lorax is not alone, many other companies claim to be “natural” but, in fact harm the environment. Even my soaps and other products at Eden’s Rivers are made from oils which come from *gasp* trees. However, the oils are usually from the fruit of the tree and I also avoid using unsustainable or harmful products. Still, I am not suggesting we ‘return to the forest.’ Modern life has its benefits including better health and an extended life, and trust me, I like a little comfort. But I try to be aware of my actions and chose the better course whenever possible. I just wish there could have been more deeds behind the words for this big budget blockbuster. But that’s not reality. Maybe that’s why I liked Dr. Seuss so much in the first place. love that layout. and i love the skin on your blog lol my hubby and i fight clsatnntoy on this global warming issue he drives me crazy Im running around turning off lights and water and fussing about energy and he is rolling his eyes. sigh.. Good luck on your presentation I have to do the green cleaning. I have MS and the chemicals and scents really bother me and make me sick.I have been using vinegar and water based products for years. « The first new spring soap is now curing—Spring Fling!